Falcon 9, SpaceX’s reusable rocket, landed back on Earth just a few short weeks ago after landing at Cape Canaveral. Yesterday, Elon Musk, the head of the SpaceX program, announced that the Falcon 9 is already ready to be launched for another mission. While it’s not clear when the Falcon 9 is set to go on its next launch, Space X’s plan for reusable rockets is a major step towards a more cost efficient approach for space missions. 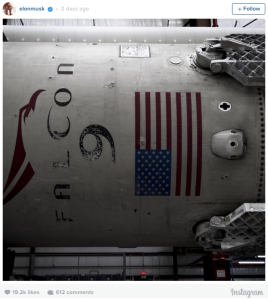 Previous reports show that it cost $60 million to make the Falcon 9 and $200,000 to fuel it, but being able to reuse the spacecraft means these costs can be lowered substantially. At present, SpaceX thinks that most of the refurbishment the Falcon 9 will require are minor adjustments and replacements.